For one reason or another, I have an aversion to the taste of raw flour in my desserts, which has lead me to avoid almost all fruit desserts. The most common thickener for the juice released during the cooking process of fruit pies and fruit crisps is some flour mixed in with the fruit, and I can’t stand it. Really. It leaves a bitter and foul aftertaste that I can’t shake for quite a while after a bite. So, last night – armed with the withering apples in my fridge, some cornstarch, and graham crackers – I made a crisp without any flour . . . and it was fantastic. And then I ate it all. Well, I did let Todd have a few bites. I have to say, I wouldn’t change this recipe one bit – it’s that good. 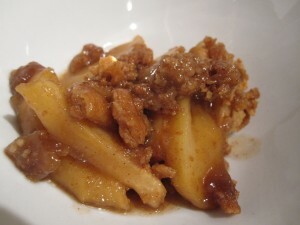 Despite the fact that it is clearly not apple season, my version of apple crisp was just what I was craving. Also, the name – apple crisp jubilee – was at Todd’s behest. He decided it was the only appropriate name. I think I agree. Written for an 8×8 pan. Double it for a 9×13 pan. Preheat the oven to 350º, and butter an 8-inch x 8-inch glass casserole dish. Toss the apple slices with the brown sugar, cinnamon, and salt. Turn into the buttered casserole, and spread into an even layer. In a separate bowl, mix the cornstarch into the water and lemon juice. Once dissolved, drizzle over the apples and stir. In a medium bowl, add the graham cracker crumbs, sugar, cinnamon, and salt, and stir until combined. Add the vanilla to the melted butter, and drizzle over the dry ingredients. Stir until moistened. Sprinkle the mixture evenly over the apples. Cover with tinfoil, and bake for 20 minutes. After 20 minutes, remove the foil and continue to bake for another 20 minutes, or until the apples are tender.